(Bayside, Calif. Wednesday, Nov. 9 2018) The Humboldt Area Foundation board announced today that executive director Patrick Cleary will remain with the foundation until 2023 as part of a long-term succession plan. Cleary will retain his role as executive director while a national search is undertaken by the board for his successor, then transition to a new role as Director of Community Prosperity and Investments in mid-2019. The Humboldt Area Foundation board announced today that executive director Patrick Cleary will remain with the foundation until 2023 as part of a long-term succession plan. Cleary will retain his role as executive director while a national search is undertaken by the board for his successor, then transition to a new role as Director of Community Prosperity and Investments in mid-2019. “Patrick has put us in a strong position so the upcoming transition is one we see as an opportunity to move the Foundation to the next level, one that will benefit the entire region and all the organizations, donors and people we serve,” said board chair Kathryn Lobato. Cleary initially announced his intention to retire to the foundation’s board last week, but the board ultimately convinced him to defer in favor of a new position advising and managing complex gifts and community investments. “The executive director position is a big job, and I am ready for a less rigorous workload,” said Cleary. During his six years of leadership the foundation’s total assets grew by 62%, to more than $128 million. That money was reinvested into projects such as the recently opened Fortuna Open Door Community Health Center building. Under Cleary’s tenure the foundation took on projects as challenging and diverse as helping finance the Carson Block renovation project in Eureka’s Old Town, the formation of the Equity Alliance of the North Coast and economic development initiative Humboldt Made. Cleary successfully developed bridges that strengthened the foundation’s financial resources and created local investment opportunities to create jobs and develop nonprofits in Humboldt, Trinity and Curry counties. This is work the Humboldt Area Foundation plans to continue with Cleary’s guidance and mentorship. In addition to local investments hundreds of grants to community organizations and scholarships are made each year. HAF has also worked behind the scenes and as a convener to bring people together to talk about challenges within our communities. “Patrick’s commitment to engaged and active philanthropy has allowed us to take a leadership and convening role in talking about sensitive issues like race, equity and inclusion, all topics important to address in building a healthy community for all,” said board member and Program Strategies Committee Chair, Zuretti Goosby. “The Humboldt Area Foundation is a truly special organization that has real and profound impacts on the people we serve. Our scope is large, our approach is thoughtful and empowering, and our staff is top notch and incredibly committed and talented. Over the last six years we have accomplished so much together to make our community better, and I know the foundation is poised for even more growth in the future,” said Cleary. For further information, please call Kathryn Lobato at (707) 223-4300. You may also email Kathryn.Lobato@gmail.com. Humboldt Area Foundation is pleased to announce the appointment of its new Donor Engagement Director, Luis Chabolla. Mr. Chabolla will begin his role with the Foundation mid-April. Mr. Chabolla returns to Humboldt County having served 17 years at Community Foundation Santa Cruz County, where he was most recently the Communications Director. Luis was also previously the Development Director for the Mexican Heritage Corporation, and the executive director of La Raza Galleria Posada in Sacramento. In his Humboldt County days, Luis was a radio host on KHSU as well as the Outreach Coordinator for Humboldt State University Center Arts. Mr. Chabolla received his B.A. in Comparative Literature from San Francisco State University. He brings a wealth of knowledge in nonprofit communications and marketing, governance and fund development. Chabolla said: “Like other community foundation throughout the country, I see the Humboldt Area Foundation as a leader in promoting positive change through innovative and responsive local philanthropy. I’m honored to be able to return with my wife Chris to an area I love and to join a great team dedicated to helping charitable people, businesses and nonprofits work together for a greater good. I look forward to meeting and talking with many of you in the coming months. HAF will host an opportunity for donors and community members to meet Mr. Chabolla in May, dates and times to be announced soon. 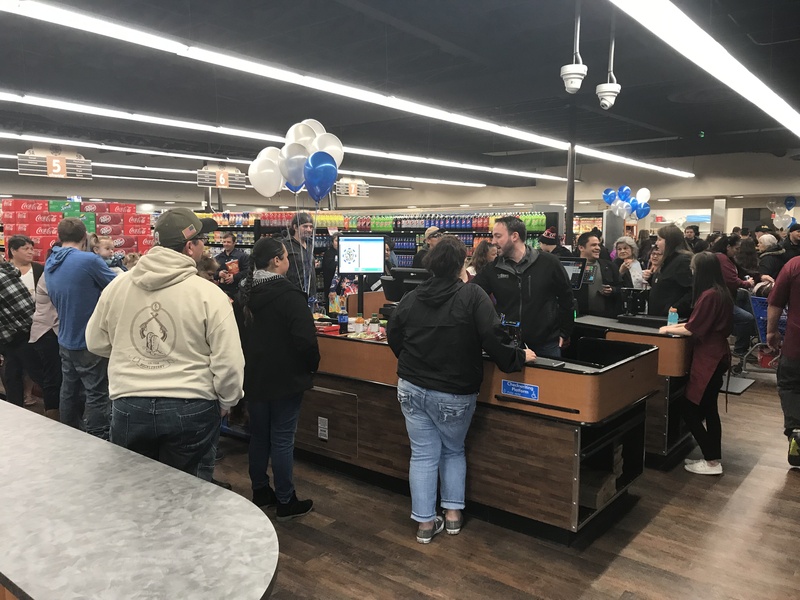 On Wednesday, March 6 the new Hoopa Shopping Center opened to great fanfare, marking the end of a long three years without dedicated food access within the Hoopa Valley. The new grocery store is tribally owned and operated and its opening marks the creation of 40 new jobs. Humboldt Area Foundation partnered with several other local lenders including the Headwaters Fund, the Arcata Economic Development Corporation, the Northern Community Loan Fund and Rural Community Assistance Corporation to lend $4.2 million in planning and building costs. If you mail your gift, make sure that it is postmarked before December 30th this year to ensure credit for a 2017 gift. The postal service has cut back its mail collection, (particularly in rural areas such as ours), therefore it is best to mail your gifts by December 28th. Online gifts may be made up to midnight on December 31st. To give to Humboldt Area Foundation online, visit hafoundation.org and select a fund of your choice or give to the Humboldt Area Foundation Opportunity Fund, a fund that responds to our community needs as they arise. Since the new tax law raises the standard deduction, many people who used to itemized deductions may no longer be best served by itemizing beginning in 2018, especially with the limitation on state and local taxes. You may consider moving some or all of your 2018 giving into 2017 for tax purposes. With some tax payers receiving a lower tax bracket under the new tax law, it could make sense to accelerate gifts into 2017 even if you still itemize. Setting up a donor advised fund, either at Humboldt Area Foundation or a financial institution is like funding a savings account for future giving. The tax deduction is available immediately, but you can make the individual giving decisions later. If you are 70 ½ or older, you can opt to make a qualified charitable distribution (QCD) from your IRA. This allows funds to be withdrawn from your IRA with no tax consequences and can be used to satisfy your minimum required distribution (RMD). Giving appreciated assets such as stock or real estate is a very tax effective way to give.You can deduct the full market price of the asset and avoid the capital gains tax on the increased value. Please do not wait until the last minute to do this, though. It is important to let you recipient know soon if you would like to do this so that the logistics can be worked out. We encourage you to consult your legal, tax, or financial adviser or contact the Foundation directly at (707) 442-2993/ patrickc@hafoundation.org. We are happy to answer your questions and assist you in making the best decision for your individual giving. Humboldt Area Foundation offices will be open 8:30am-5pm through the holidays, except for December 25 & 26th. We invite you to give us a call or stop by our offices in Bayside at 363 Indianola Rd.